Today I visited the Goodwill Thrift Store off Calvine Road in the outskirts of Elk Grove after bringing my husband some coffee at work. This location is very new, super clean, and didn't have any interesting smells like I've experienced at a couple other stores. "Thrifting" is a newer activity to me. My friend, Jackie was the first person to introduce me to the way one shops in these stores and I have found it to be quite fun! A few tips when you go thrifting is to wear comfortable clothes that are easy to change out of. It is a good idea to try on any clothing you might want to purchase. Thrift stores, unlike retail stores, won't allow returns. If you have buyer's remorse, like I often do, make sure you really like the item before you buy it. All of the items I found had the original tags on them! 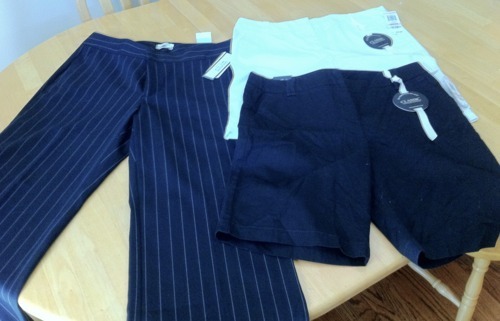 My clothing purchases totaled $17.00, less than half the price of one of the pairs of capris normally. YAHOO! Do you shop at thrift stores? What have been your experiences?